Here is a spin on the famous BBQ Sundaes. I think you will love this version. You can mix and match glassware for presentation. If it is for a potluck, pile the ingredients in a trifle dish. For a more casual twist, serve them in clear plastic cups. There is no set way to layer theses, mix and match them anyway you like. Or, set everything out separately and let your guests decide how to stack them. In a bowl mix together, slaw, garlic, scallions, parsley, red and green bell peppers. In another small bowl, whisk olive oil, vinegar, mustard, horseradish , Slap Ya Mama Hot Blend Cajun Seasoning and salt. When thoroughly combined, pour over vegetables and stir to coat. Refrigerate until ready to use. 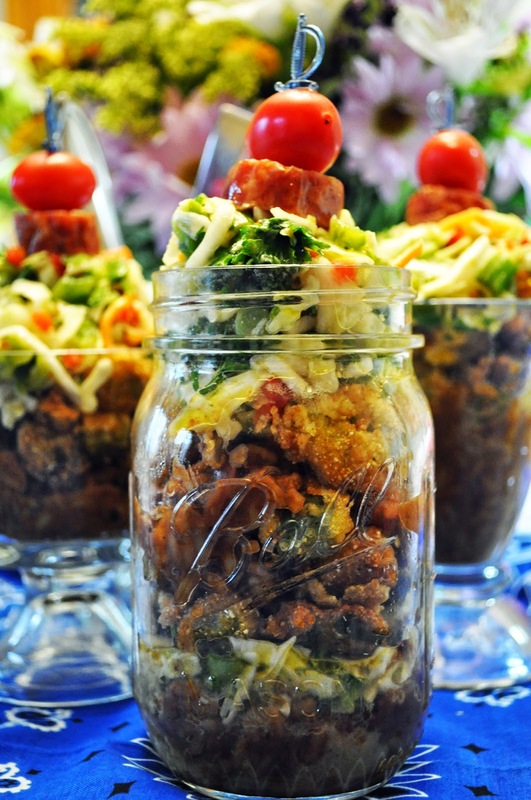 Assemble the Sundaes by layering Red Beans and Rice, Okra, and Cajun Slaw. Top with a heaping pile of Cajun Slaw. Garnish with cherry tomatoes and a sausage slice.